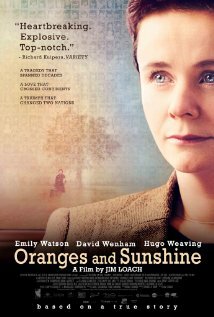 Oranges and Sunshine by Margaret Humphreys chronicles the heartbreaking true story of 150,000 British children who, over the course of many years, were deported from England to Australia, Canada, Zimbabwe, and New Zealand without the permission or knowledge of their birth families. Ripped from the only home they had ever known, these innocent children were sent thousands of miles from their home to institutions where in many instances, they were subjected to repeated emotional, physical, and sexual abuse. Most of them were told their parents were dead even though they were not. Their names and birth dates were often changed and their records destroyed leaving them with scant tracks to follow to their true identities. Mrs. Humphreys, an English social worker discovered these long-standing child migration schemes quite by accident. She went on to establish the Child Migrants Trust in effort to help heal the migrant victims wounds and reconnect them with their remaining English families. I cried many times while reading this book. It is horrible to conceive, much less to accept, that children were used by governments and charities as living tools to propagate English territories. This book was made into a movie in 2010. If you can’t read the book, see the movie or one of the documentaries based on this shameful practice. It is a heartbreaking story which deserves attention. This entry was posted in Uncategorized and tagged Australia, Books, Canada, child migrants, child migrants trust, England, Margaret Humphreys, New Zealand, Oranges and Sunshine, orphans, Zimbabwe. Bookmark the permalink. This topic is important to me. I have not heard of this film or book, and I’m very excited about reading/see the story! Sounds like the film “Rabbit Proof Fence”. You would appreciate it, I believe, if you haven’t seen it already. Same topic. Thank you for your comment on this book! Now that you mention it, I believe I’ve seen Rabbit Proof Fence. Thanks for refreshing my memory! Please let me know your reaction to this book/movie.